A highly concentrated, fast dissolving powdered detergent formulated for optimum performance in hot water extraction carpet cleaning equipment. Double Clean contains high quality ingredients for cleaning heavily soiled carpets, plus a special corrosion inhibitor to protect machinery. Formulated for optimum performance in cleaning heavily soiled carpets. Contains high quality anionic and non-ionic surfactants, alkaline builders and corrosion inhibitor. For professional and industrial use only. Portable extraction machines - Mix 15ml to 30ml (1 to 2 measure scoops) of Double Clean per 10 litres of hot water (1 to 500) in the machine solution tank. 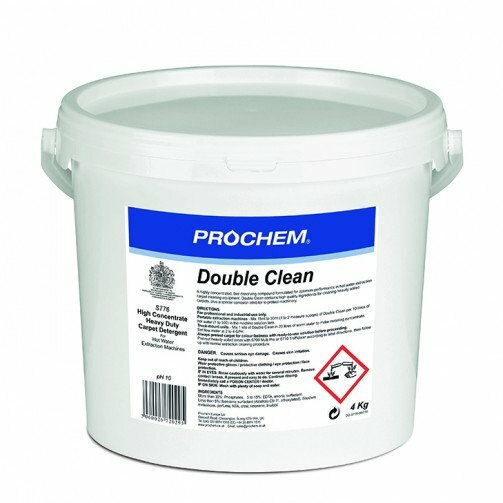 Truck-mount units - Mix 1 litre by volume of Double Clean powder in 20 litres of warm water to make metering concentrate. Set flow meter at 2 to 4 GPH. Always pretest carpet for colour fastness with ready-to-use solution before proceeding. Pretreat heavily soiled areas with S709 Multi Pro or S710 Trafficlean according to label directions, then follow up with normal extraction cleaning procedure.